For weeks rumors have been flying there would be a new Nintendo Direct today, and yet, The Big N refused to provide any confirmation. Well, it turns out the rumors were true, as Nintendo decided to unleash their latest presentation without any warning this morning. If you’ve got 15 minutes to spare, you can check out the entire presentation below. It’s short, but it covers a lot of ground! Nintendo’s Pokémon fighter keeps on growing with a new DLC Battle Pack. The first half of the Battle Pack, which includes new fighter Aegislash and support Pokémon Mega Rayquaza and Mimikyu, will be available on January 31. The second half, which includes the classic Blastoise and support Pokémon Mew and Celebi, hits March 23. Mew is just a support character? That’s a little lame, but, otherwise, a decent selection of new stuff. The Pokkén Tournament DX Battle Pack will set you back $15. This February a new Super Mario Odyssey update will be released, which adds new costumes, photo mode filters, and the competitive Balloon World mode. Overseen by Luigi, Balloon World challenges you to hide balloons in tricky spots around existing stages. Other players will then have a limited amount of time to try to find as many balloons as possible. A simple addition, but it looks pretty fun. 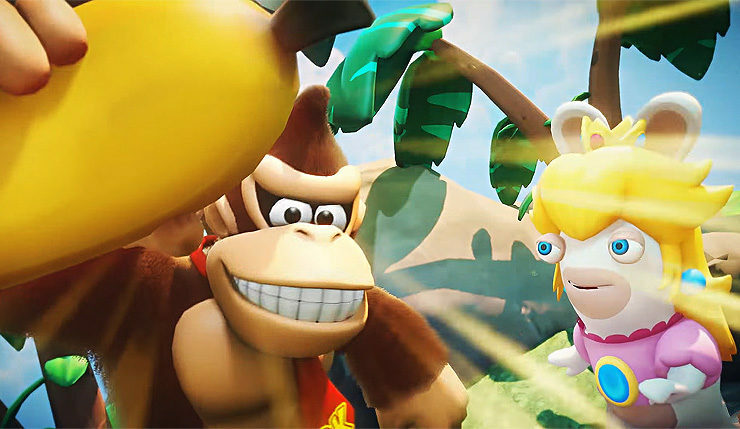 Sometime this Spring, Mario + Rabbids Kingdom Battle will be adding Mario’s old frenemy Donkey Kong to the mix. Presumably, we’ll also be getting some new levels and challenges along with DK. This Mario + Rabbids add-on will be paid DLC, but Nintendo has yet to specify a price. What do you think? Excited for some of these additions? Is Nintendo doing enough to keep their 2017 games feeling fresh?